As you can probably tell from the video, my voice is super hoarse right now, and that’s from travelling! We spent a few days in the UK with Universal Audio at AIR studios Lyndhurst. AIR studios is short for Associated Independent Recording, which is an independent studio founded in London in 1965 by Beatles producer Sir George Martin and his partner John Burgess after their departure from EMI. I was lucky enough to meet George’s son, Giles Martin, while we were at the studio! So why were we at Air Studios? It was because of Universal Audio. Universal Audio has been synonymous with innovative recording products since its inception in 1958 by Bill Putnam Sr.. A favorite engineer of Frank Sinatra, Nat King Cole, Ray Charles and more, the late Bill Putnam Sr. was a passionate innovator who is widely regarded as the father of modern recording — with many of his legendary studio and equipment designs still in use today. 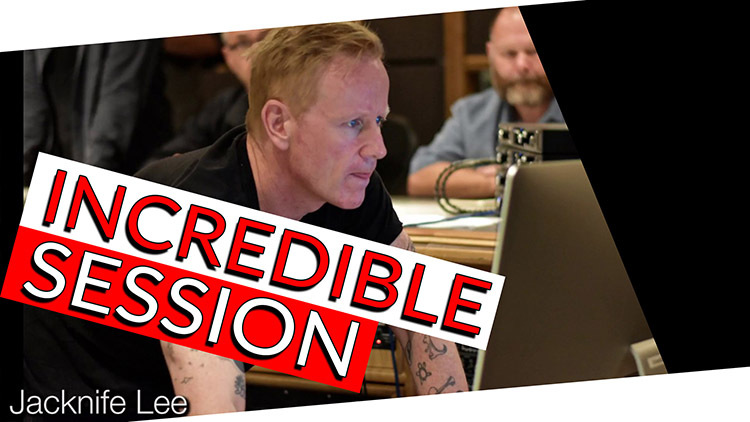 His son, Bill Putnam Jr. now runs Universal Audio and makes some incredible plugins, but in this instance they wanted to talk about the brand new Apollo; the Apollo X Series. The Apollo X is their new flagship Thunderbolt 3 audio interfaces, featuring elite-class A/D and D/A conversion, new HEXA Core UAD plug-in processing, Unison mic preamps, +24dBu operation, Surround Sound, and more. All in a sleek, expandable Thunderbolt 3 package for Mac and PC. It was an amazing event featuring Two Door Cinema Club, an indie rock band from Northern Ireland which was produced by Jacknife Lee. Jacknife has an incredible list of credits including the Cars, U2, R.E.M., The Killers, Robbie Williams, Snow Patrol, Bloc Party, AFI, the Hives, Weezer, One Direction, Silversun Pickups, Editors and Taylor Swift. The engineer who did the string session was Olga FitzRoy who got her start at AIR studios about 10 years ago after completing an internship at the studio! Since then, she has worked on records for Coldplay, The Foo Fighters and Muse, as well as film scores for top composers including Hans Zimmer and Dario Marianelli. I went down to this event with a little tiny portable camera and cell phone. I didn’t bring Eric or Andrew (as much as they would have liked to come!) – it was very punk rock in terms of the video shooting/quality, but it should give you a good idea of what the event was like! While I was there I got to meet Andrew Scheps and Tchad Blake- Fab Dupont was also there working for Universal Audio demonstrating the Apollo. It was really wonderful! It was an amazing time! Of course, my wife, Kasia, came as well- she’s a professional photographer and she took a whole bunch of photos, which are featured in the video below. Oh! I also ran into Steve Levine, most famous for his work on Culture Club’s studio albums!From the early 1980s, with the worldwide success of Culture Club, Steve’s reputation grew and he produced well-reviewed work for The Honeyz, John Howard, China Crisis, Motörhead, Ziggy Marley, Westworld and Gary Moore. Special thanks to Universal Audio for inviting us to this amazing event! Please watch the video below and leave a ton of comments!